Joe McGrade is a man of many words. 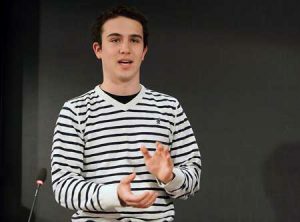 And his verbosity served him well indeed at the recent World Universities Debating Championship in Manila, Philippines, where the member of the McGill Debating Union (MDU) was crowned Top Public Speaker. McGill has a long history of strong showings in the “Worlds” public speaking category. MDU member Riva Gold took home first place in 2010, following up on wins by Andrew Zadel in 2001 and Adrianne Thomas in 1994. That said, calling McGrade a dark horse winner this year would be a major understatement. The 20-year-old Toronto native and third-year Economics major wasn’t initially picked to be part of the eight-person (four teams of two) MDU contingent that participated in the event that brought the world’s finest university debaters to Manila’s De La Salle University Dec. 27 to Jan. 4. McGrade applied to be a participating debater, but didn’t make the cut, even after two more spots opened up when a McGill pair dropped out of the long and expensive trip. He was slated to go to Manila as one of three McGill judges until the MDU was eventually offered a spot for a fourth team. In his first speech, about “the difference between First World problems and real problems,” he combined his cutting sense of humour, love of righteous indignation and his experiences and observations of Manila. “The university we were in was very nice and the hotel was beautiful. And then you’d go around the corner to get a coffee and it was completely different,” says McGrade, who has been a public speaker since his elementary school days and started organized debating in Grade 7. “People were living in abject poverty. And I felt terrible standing there in my dress shoes and shirt with my latté. Meanwhile, back at the main debating event, McGrade and partner Emma O’Rourke-Friel were creating a pleasant surprise of their own. After nine rounds of debating topics like private health care, the free movement of labour, and defamation laws in academic discourse, they finished in 47th place out of approximately 350 teams, making them they highest placing Canadian team. McGrade and his MDU teammates will participate in the North American Debating Championships at the University of Toronto this coming weekend. The Canadian national championships, which McGill captured as recently as 2010, take place at York University, March 16-18.